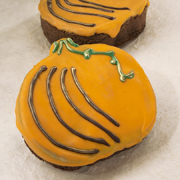 Our pumpkin shaped brownie is orange chocolate brushed with food luster and decorated with a twisted vine. Each chocolate confection is wrapped in a cellophane bag and tied with an autumn ribbon. Ingredients: Ingredients : dark, sweet chocolate, green and chocolate candy writers (sugar, palm kernel oil, cocoa, non-fat dry milk, dry whole milk, glyceryl lacto eaters of fatty acid, salt, artificial coloring), orange food luster.